Has your pet suddenly fallen ill or had an accident? We have a list of contacts for emergency help with your pet. If your pet becomes ill outside your vet’s normal opening hours it can be a worrying time for you. 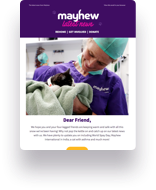 Mayhew's Vet Clinic is for preventative care only, however we can provide a list of emergency veterinary practices. Your vet, even if closed, is obliged to have another veterinary practice providing care for their usual clients. Please call them and listen carefully to their out-of-hours answerphone message. If you have any difficulty getting through, Elizabeth Street Veterinary Clinic is open 24 hours a day for emergency care. Please phone ahead if possible. If you have a foster animal from Mayhew, please try to call us for advice. In an emergency, please attend either RSPCA Putney or Harmsworth. If your animal has recently undergone neutering surgery here and you have a concern, please follow the instructions on your pet’s discharge sheet. Our Animal Welfare Officers are available to deal with any welfare cases. If you've found a stray animal, we can provide advice.